NOBODY SAID IT WOULD BE EASY! | Champions 4 Christ Inc.
I’m amazed that it does not matter how old you are, what gender you subscribe to or what your faith tradition may be. When it comes to life on earth, nobody said it would be easy. This morning I reflect on a wonderful occasion recently at church. My son and daughter in law had our granddaughter dedicated to God. I was thrilled to perform the services for my granddaughter. It was wonderful seeing our children realizing the importance of what my wife and I teach in reference to everything belonging to God. Psalm 24:1 tells us “The earth is the Lord’s, and the fulness thereof; the world, and they that dwell therein.” That tells you and I that God owns everything even our spouses, parents, children and things/objects. As I held my granddaughter, I thought about what she would face as she grow older. I thought about our age difference and what my life experiences has been. I thought about how we live our lives as children. I thought about how we live our lives as spouses. I thought about how we live our lives as parents. 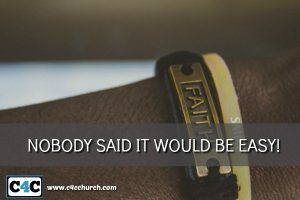 Finally, I thought about all of the other titles we would live our lives as, and I came to a not so surprising revelation that “Life is hard!” and NOBODY SAID IT WOULD BE EASY! For many of us our default in life is to want to make life easy for those we care about. I believe this to be a very noble deed. However, I have learned throughout my life that no matter what we do for ourselves or others, life is not always easy and NOBODY SAID IT WOULD BE EASY! We can be the very best we can and we will still become disappointed or disappoint those we care about. Our thoughts and emotions have a way of telling us not to be grateful because life is currently not what we want it to be. It then becomes difficult to see how good God is to us and how good God has been to us. Then, we become upset with ourselves, others and God. We become unappreciative, self-centered and cantankerous. We begin to find fault before we find favor. We look for the bad before we look for the good. We can’t see the sun for the clouds and we develop an attitude that draw people away from us than drawing people to us. I firmly believe that just because life is not easy doesn’t mean that life is not good. I believe that life is good in spite of my situation. I believe that life is good in spite of my circumstances. I believe that life is good in spite of my condition. It does not matter to me about what I have lost or attained. I’m grateful for my wife who loves me unconditionally in spite of all of my flaws. I’m grateful for my children who loves me in spite of all of my imperfections. I’m grateful that I can not only receive unconditional love but that I can also give unconditional love. Above all, it’s good to know and believe what is recorded in Nehemiah 8:10b that “The Joy of the Lord is our Strength”. Yes, life may not be the way we want it to be. Our spouses, children, family, friends, neighbors, co-workers, government officials, fellow christians and even ourselves can be a source of disappointment but I believe that in spite of it all, I remember the words by Willie Neal Johnson “When the road is rough, and the going gets tough, and the hills are hard to climb. I started out a long time ago, there’s no doubt in my mind; I have decided to make Jesus my choice. NOBODY SAID IT WOULD BE EASY!